XANA is a multi-agent program who is hell-bent on killing our heroes. Just how did it gain awareness and want to destroy humanity? 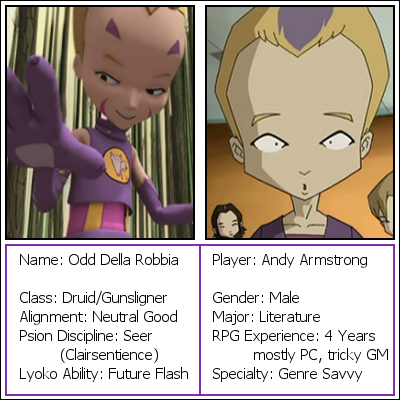 The answer lies within Lyoko. Taylor hasn't played RPGs as long as their fellow players, but they are having a great time all the same. They try to follow the rules to the letter, but they are easily swayed by rule of cool. As such, Taylor often switches between being excited to nervous about trying new things, but perhaps playing as GM will give them the experience to balance tradition and wild imagination. Taylor's color is Yellow. As the GM, their text is in boxes most of the time. Jeremie is a brilliant student who found and activated the supercomputer in the factory. 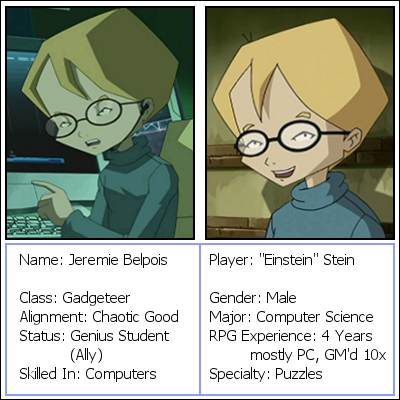 He doesn't go to Lyoko, but he's no less important as he mains the computer interface and scanners. "Einstein" tends to pass up magic and brute strength in games and prefers to tinker with the technology of the era. He doesn't mind playing a support role since it keeps him and others alive, but don't dare dismiss him as "unimportant." He takes things a bit personally and gets annoyed easily when things don't go his way, but his friends help him keep things in perspective. Stein hates being called by his first name. Stein's color is Light Blue. Odd is a new transfer student who got more excitement than expected. Now he fights evil as a gunslinging werecat! He has an animal companion named Kiwi. Loud and proud, Andy's a person who lives for what's awesome and fun. Unlike his roommate, Eric, Andy could care less about what's impossible or normal. He'd rather invent new tricks and do the opposite of what's expected just to keep the game interesting. The one thing that rarely changes in his playstyle is his need to have an animal companion. Subtlety is a weak point of his as he prefers to just charge in, both in-game and in real life. Andy's color is Purple. Eric was invited to one of the group's sessions and decided to stay to see where the story goes. Even though he's Andy's roommate, Eric is very introverted. He's very finicky about things making sense, regardless if it is fiction. Still, he is into the fighting aspect of D&D as he often plays tank and tries to protect the others. Eric's color is Green. 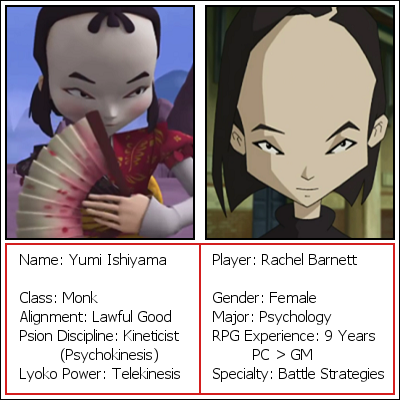 Yumi is a Japanese Lyoko warrior who fights in a virtual world to save the world from an evil virus. As the oldest, she is much more mature and sensible than her teammates. Rachel may be new to the group, but she is no stranger to D&D. She prefers the fighting to the roleplay, taking down as many enemies as she can, but that doesn't mean she ignores what's happening in the background. Striking down an enemy with a sword is fun, but Rachel also likes striking at the enemy's psychological weak points. She is always looking to challenge herself and may deliberately do some foolish things to make things harder, just so the victory is sweeter. Rachel's color is Red. 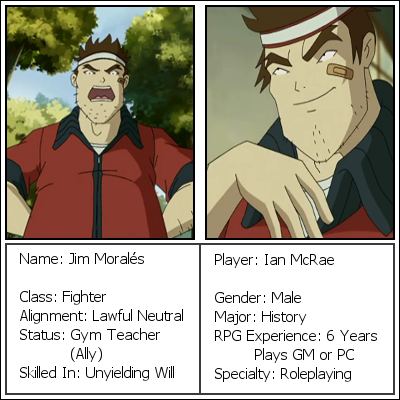 Jim Moralés is the gym teacher of Kadic Academy. He was a drill Sargent for the Armée de Terre, and he knows a number of martial arts techniques due to his many years of service and habits of picking up whatever is useful. His military days are still with him as he ensures that everyone follows the rules of Kadic. Ian is very enthusiastic about D&D; he especially loves the roleplaying aspect and comes up with the most outlandish of backstories. He gets a bit carried away sometimes and often justifies his actions as something that his character would do, but he hasn't done anything too mean so far. He is aware that everyone has different playstyles and tries to ensure that everyone gets a chance to do what they want. Ian's color is Grayish-Black. 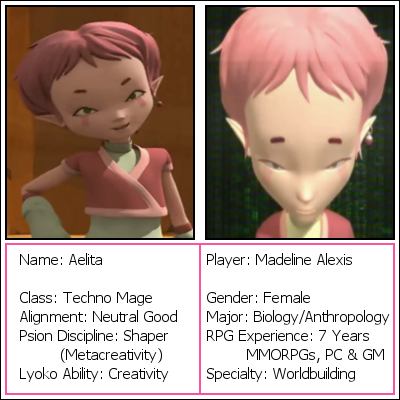 Aelita is a virtual being who lives on Lyoko, but she has no idea what her purpose there is. Her friends work together to materialize her to Earth and free her from XANA. 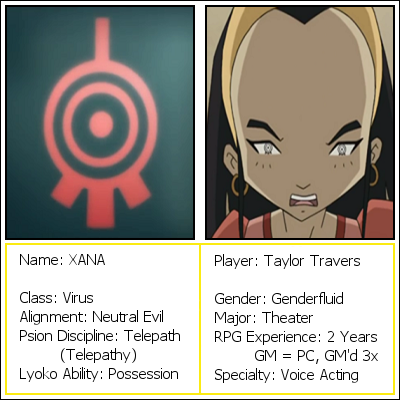 She has no weapons, but her connection to Lyoko allows her to alter the terrain however she wants. Madeline has severe anxiety which keeps her cooped up in dorm room. She usually only leaves for classes. 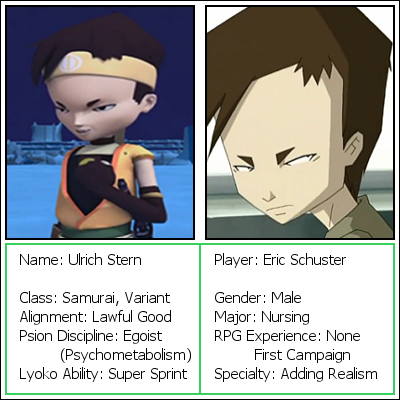 Before joining the Lyoko campaign, she has mostly played RPGs and roleplaying forums online. However, she wanted to try her hand at tabletop games and be in the same room as other people. Taylor offered her to join, but Madeline only appears through her webcam. She tries to stick with what her character wants while also keeping the group’s wants in mind. Madeline’s color is Pink. 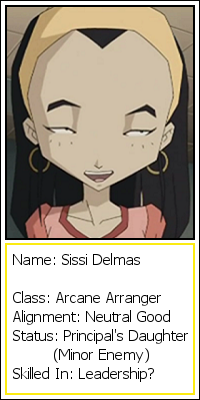 Sissi is the so-called "Queen of Kadic" who causes a lot of trouble for our NPCs. However, as the principal's daughter, she can pull a lot of strings to get people out of trouble, but only if there's something in it for her. She is also a strong well for gossip. 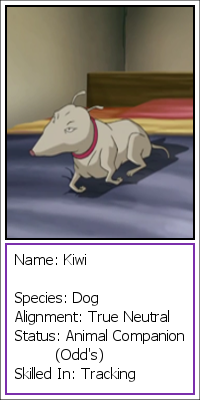 Kiwi is Odd's animal companion and Team Lyoko's mascot. He mostly lies around and eats, sometimes helping the group during a crisis. Pets aren't allowed at Kadic Academy, but Andy always insists on having an animal companion, even if it causes him trouble to keep Kiwi out of the staff's sight. Why Andy decided that Odd should have a cat form yet have a pet dog is anybody's guess.